We describe a new sequence capable of measuring both perfusion and myocardial strain using DENSE  in a single scan. The images possess dark-blood contrast and upon infusion of Gd-DTPA, ischemic areas remain bright while normal areas become dark. The phase maps of the same images provide displacement and strain maps, which facilitates the correlation of function and perfusion. This technique should enhance the diagnostic value of time-limited stress tests. Scans were performed on a 1.5 T Siemens Avanto scanner. In anesthetized Yorkshire pigs (n = 2) the diagonal branch of the LAD was ligated for 90 minutes to induce ischemia, and then released for reperfusion. Perfusion-strain scans were performed before and during ischemia and after reperfusion with 3 separate IV infusions of 0.1 mmole/kg Gd-DTPA (Magnevist) at 3.0 ml/sec. A multi-slice, single-shot DENSE sequence with true-FISP readout was used to acquire 4 short-axis slices in a heartbeat (Fig. 1). The most basal slice was acquired first without refocusing the encoding moments, and provided a saturation-recovery type of LV cavity blood signal for estimating the contrast input function [2, 3]. Gradually ramped flip-angles through the readout train equalized the echo amplitudes. Imaging parameters were true-FISP echo spacing of 2.5 ms, matrix size of 128 × 40, FOV of 512 × 120 mm with restricted excitation(4) (equivalent to a matrix size of 128 × 96 and 3/4 phase-encode FOV), slice thickness of 6–8 mm. A data set contained 360 images of 4(slices) × 3(encoding directions) × 30(repetitions). The 3 encoding directions combined in-plane encoding of 4.0 mm/radian in-plane and through-slice of 1.0 mm/radian. Each direction was acquired in a separate heartbeat. The interval between scanned heartbeats was spaced over 2.0 sec to allow spin recovery. Timing diagram of the acquisition of the 4 slices in a heartbeat. In a pig ischemia model, myocardial strain and perfusion were imaged simultaneously with a T1-weighted displacement-encoded (DENSE) sequence during the first pass of Gd-DTPA. The dark-blood positive contrast of the sequence aids image registration and quantitative perfusion mapping. The scan lasted 3 – 4 minutes during which the contrast was given. Due to T1 relaxation between displacement-encoding and slice acquisition (200 to 400 ms for the 3 perfusion slices), normal myocardium became dark upon Gd infusion while the ischemic region remained bright. Perfusion and strain were measured in the other 3 slices. All images were registered with deformable registration to remove respiratory motion. Pixel-wise perfusion maps were obtained with Marquardt-Levenberg fitting using the Fermi transfer function . Circumferential strain maps were obtained from each set of 3 encoding directions , and then averaged over the 30 sets. 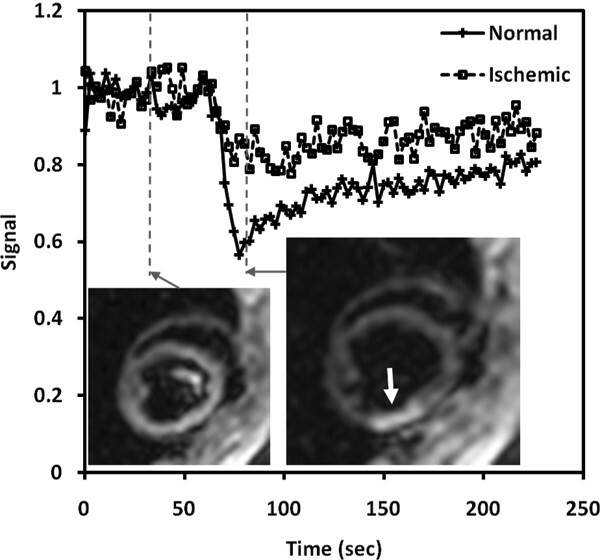 The myocardial time-intensity curves of a normal (anterior) and an ischemic (inferolateral) segment are shown in Fig. 2 during occlusion, with representative images. The quantitative perfusion (in 0 – 2 ml/g/min scale) and strain (in 0 – 0.2 scale) of the 3 slices of a pig before, during ischemia and after reperfusion are shown in Fig. 3. Reperfusion resulted in partial recovery of flow, and recovery of function in the periphery of the ischemic zones. Time intensity curves of normal and ischemic segments during occlusion and images before and after Gd infusion. Perfusion and strain maps of 3 slices before and during diagonal artery occlusion and after reperfusion. Arrows point to ischemic regions. To our knowledge this approach is unique because of the positive contrast unlike conventional saturation-recovery imaging, and therefore may not have the associated artifacts such as dark rims. A limitation is the lower temporal resolution needed for spin recovery. However, at 3 ml/sec injection rate this did not affect the perfusion measurements in this study. Future work will include comparison with microsphere flow measurements.